Mpho “Popps” Modikoane first came to national attention as a contestant who made it to the final of the 2009 local hit reality show, So You Think You’re Funny. After this initial exposure he became a regular on the Johannesburg comedy club circuit, sharing the stage with the likes of Trevor Noah and Marc Lottering. This was followed by a spot on the line-up for David Kau’s national comedy tour: Blacks Only (2009, 2010, 2012, 2013), where his performances were invariably lauded with standing ovations. Other shows Mpho has performed in as a comic include: Just Because Comedy Festival at the Market Theatre (2009), a twelve week/forty-four show run at Gold Reef City’s Loads of Laughs (2011 – 2012), Bafunny Bafunny (2012), Mass Hysteria as the Minister of Youth (2013) and headlining The Comic's Choice Awards™ Showcase (2013). 2010 was characterized by, in addition to performing to sold-out stand-up shows, a return to television with appearances on Mzansi Magic’s Opening Guys and Late Night with Kgomotso. Further TV appearances of note have included working as a writer and performer on the Mzansi Magic improvisational show, Laugh Out Loud (2011 – 2012), filling in for Trevor Gumbi with Minnie Dlamini on the talk show Headlines (2013), and appearing as a guest on Noeleen’s Three Talk (2013). Mpho, however, is not just a comedian, he’s also an accomplished dancer, having reached the quarter-finals of Strictly Come Dancing South Africa season 6 (2013). The icing on the cake that was 2010, saw Mpho nominated for Best Newcomer at the first annual South African Comic’s Choice Awards. He was again honored as a final nominee for The Comic’s Choice Awards™ Newcomer award in 2011, a final nominee for The Comic’s Choice Blackberry® Breakthrough Act Award in 2012, and returned as The Comic’s Choice Blackberry® Breakthrough Act Award winner in 2013. He is also an exceptional opening act, at both large-scale and more intimate sized events, having headlined various shows, being an experienced Master of Ceremonies and having a number of award show presenter engagements under his belt. Mpho understands that though he has managed to climb up the ladder in the comedy industry in South Africa, even the lower rungs are out of reach to many who are still disadvantaged by the legacy of apartheid. To this end, Mpho has tried to bring the ladder within reach of many future South African comedians by teaching children from disadvantaged backgrounds about comedy and the intricacies of the comedy industry. In continuation along the vein of mentoring South Africa’s future, Mpho has starred in the first two of a three part series that engenders financial literacy in South Africa’s previously disadvantaged youth, as well as a similar series to cultivate leadership behavior among the same cluster. The first and second instalments in the financial literacy series, Smart Bucks I (2012) and Smart Bucks II (2013), were each presented to 15,000 learners across the country during their eight-week runs, and were nominated for Loerie Awards in the Ubuntu Category. The first installment in the Leadership series, Step Up! Let’s Lead, has already reached 15,000 learners in the first two weeks of its release. He has also presented his talent in one of the toughest comedy markets: the United State of America. In May 2013 he performed at the legendary Laugh Factory and renowned Comedy Store in Los Angeles, CA. This provided him the opportunity to network with comedy greats that included Dane Cook, Norman Lear, Carl Riner and Bill Cosby. 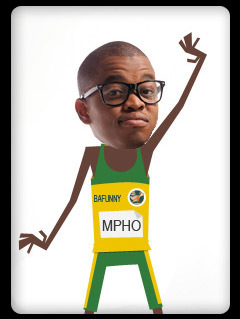 Most recently Mpho is recognizable as the face of the MiWay insurance ad campaign (you know, the guy whose geyser gave out and drenched him while he was trying to eat his cereal). Mpho also made the “Mail & Guardian 200 Young South Africans 2013” list, and consults as the Creative Group Head at Ireland/Davenport.